CRM’s are used to grow and Retain Relationships. In today’s market, the winning competition are using the CRM advantage. TIMMS CRM Australia – Why do I need a CRM? Using a CRM for Marketing. TIMMS CRM will help your company’s marketing strategy by enabling new frontiers in access to information. TIMMS CRM is a simple way to personalise content for your prospects and yield the very best, high quality leads. Gain valuable insight from all of your customer interactions & use it to drive more timely and relevant campaigns and followups. Using TIMMS CRM for sales? Our CRM is above and beyond traditional sales systems designed to enforce data entry and allows for your team to spend more time selling. It allows you to easily sort your Pipelines client importance/urgency, so you can be prepared to actively engage at the best times and keep in control of your pipeline and accounts. How do I support my customers better? Customer satisfaction is gold in todays age. Support teams canutilise TIMMS CRM through your customer service ecosystem so they have what they need to expertly engage. From call centers, help desks, social media sites; the TIMMS CRM platform allows the very best rapid customer insight and real-time collaborating required to deliver the best support to each customer, all of the time. How do I install TIMMS CRM or personalise it? Personalize TIMMS CRM and your pitches by identifying all of your key prospects and or segments with the reporting CRM engine. Capturing information from multiple channels allows you to focus your marketing efforts on the very best key prospects. Customisation of your information is simple in Sugar. Improved customer engagement is the end result. 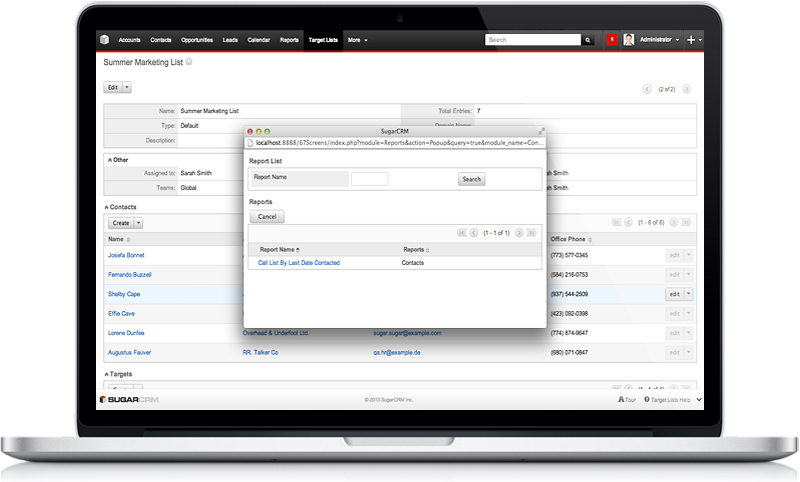 TIMMS CRM supports tracking of emails and newsletters, advertising campaigns through trade shows, radio ads, etc. It can accommodate your Google adwords or social marketing efforts. It allows you to then determine the most effective mix of advertising channels, so your marketing budget is spent wisely. Keep in contact with your most important thing – your clients. Automate and record customer events and or their activities to always keep in touch for relevant and timely opportunities to engage with your client. Sending out timely newsletters from your TIMMS CRM back-end always keeps you in your prospect’s first thought when they need something. How to track my leads? with TIMMS CRM! You can now align with the sales team. 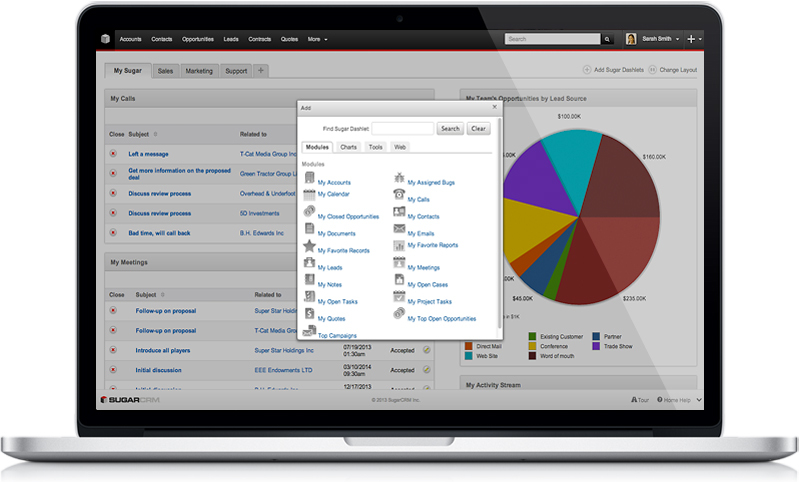 Create insight and actionables in the hands of the sales team. Allow for their feedback and ensure only high quality leads flow into their sales funnel. Coordinate and create workflow processes for more timely, follow ups, & monitor the activity of leads throughout the sales process and the building of the pipeline. 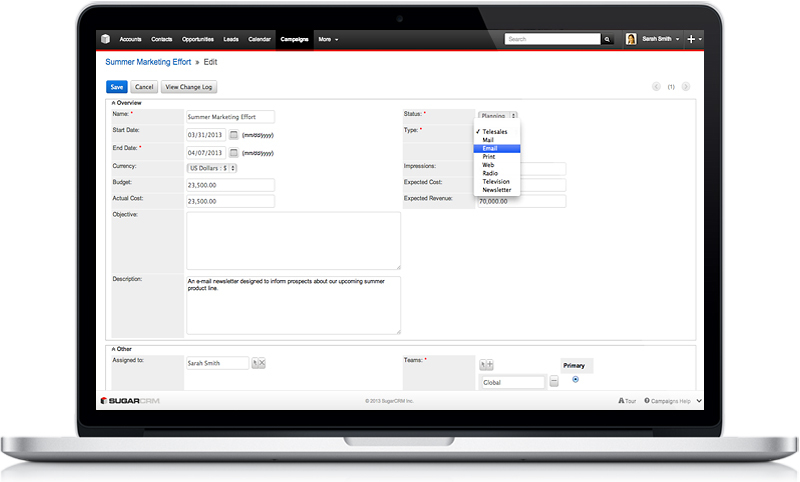 TIMMS CRM can create reports and simple functions to track which campaigns, leads, and accounts resulted in sales. 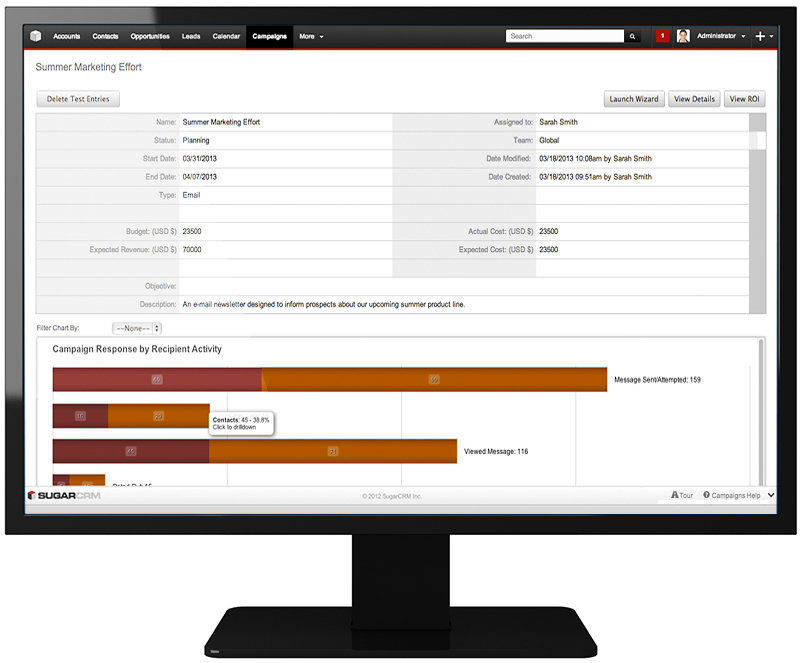 The campaign-to-deal reports allow you to monitor your marketing investment and ROI. How do I manage my pipeline better? With TIMMS CRM! Sell on time and see instant reports, Personlising key accounts is easy. Track the early signs of changes that could possibly affect your pipeline & stay ahead of forecasts, spending time where it counts, and meet your targets every month. You can automate your day to day tasks. Sell more – Automatically drive follow ups and deal changing alerts, move leads to other teams, assign new opportunities, and monitor activities instantly. CRM’s built-in email integration for Gmail, Yahoo! Mail, Microsoft Outlook, IBM Lotus Notes, and IMAP based email servers. You can easily integrate Sugar with Gmail, Google Docs, Google Calendar, Google Contacts, and Box.com. Instant reporting and dashboards about your pipeline, progress to target quota, key account activities and opportunities, and sales rep performance. You design the reports by the click of a button so every sales team can access the insight they need to drive new performance. TIMMS CRM comes with a pre-installed social aggregator that actively seeks out and provides up to date information on customers and prospects from social media websites. TIMMS CRM has the flexibility, agility, and simplicity that enables anyone to personalize the platform so you can sell your own companies way. You can Configure it to fit your sales process, your own special forecasting practices, your team and your business methods. With TIMMS ERP software being integrated as a base service, you can also add on new features and controls by spending time with our TIMMS CRM representatives. 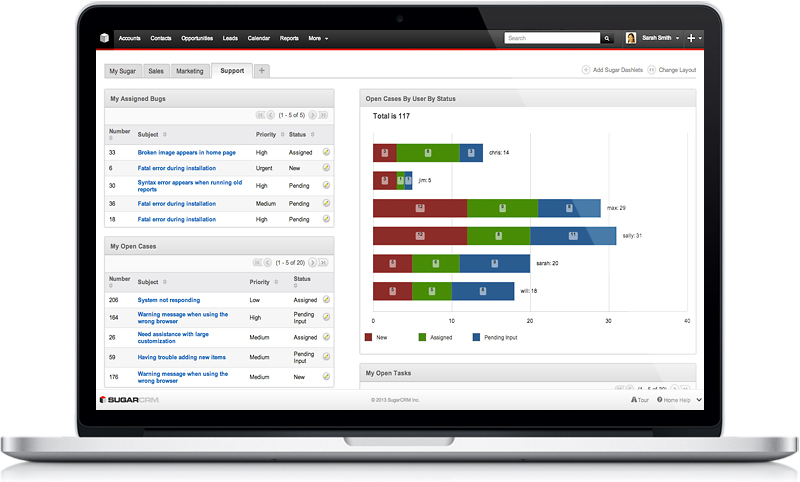 Call today for your FREE TIMMS CRM demo! 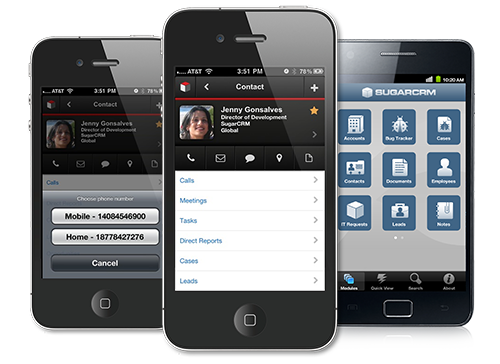 We install for clients in Melbourne, Sydney CRM, Brisbane CRM & Perth CRM – just call today.